Sequences planned FLAIR, T2 , DWI, T2*GRE, T1W PC. Single voxel MRS at short TE of 35ms. An ill defined right insular focal parenchymal swelling, hyper intense on T2 and FLAIR with low signal on T1, a patchy enhancement on post contrast T1. No dense dystrophic calcification or hemosiderin staining on T2*GRE. Mild compression over right lateral ventricle. No significant mass effect or mid line shift. On MR Spectroscopy, markedly reduced NAA and Creatinine, raised choline. 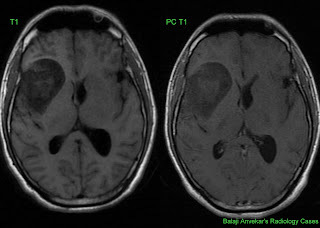 Imaging findings are typical of Anplastic astrocytoma. 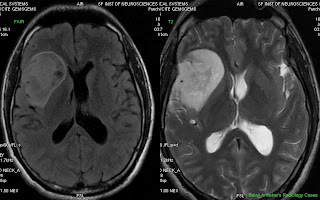 Syn: WHO Grade III astrocytoma - intermediate between low grade (diffuse) astrocytoma (WHO grade II) and GBM (grade IV), Malignant astrocytoma, High grade astrocytoma. Definition: A diffusely infiltrating astrocytoma, focal or diffuse anaplasia and marked proliferative potential. AA contributes ~ 1/3 of all astrocytomas and ~ 25% of Gliomas. 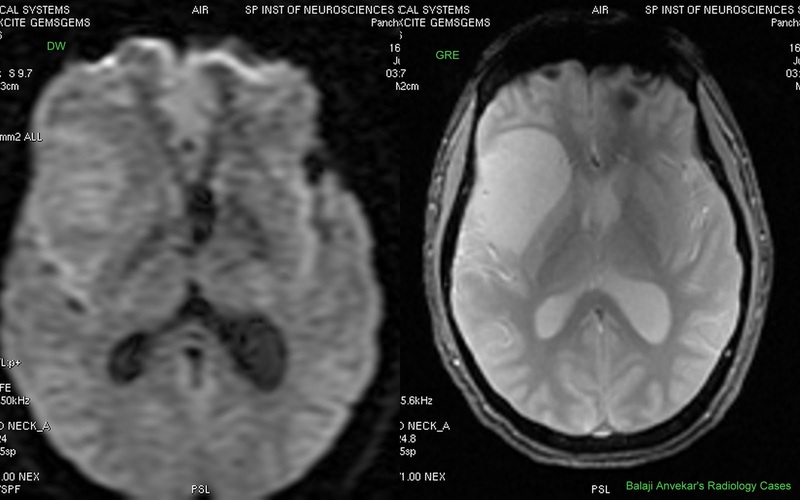 Imaging wise diagnostic clues is an ill defined hemispheric white matter mass. May appear well circumscribed. Variable enhancement, typically none; may be focal or patchy. Commonly involve hemispheric WM, frontal and temporal lobes. In children, may involve Pons, thalamus and less commonly involves brain stern, spinal cord. On CT, low density ill defined mass. Calcification and hemorrhage rare. Majority do not enhance. Enhancement may be focal, patchy and heterogeneous. If peripheral enhancement, consider malignant progression to GBM. TlWI : Mixed isointense to hypointense WM mass. Areas of hemorrhage rare may appear bright on T1. T2WI and FLAIR : Heterogeneously hyperintense, infiltrates adjacent brain. Involve and expand overlying cortex. DWI: No diffusion restriction is typical. T1 PC : Usually no enhancement. Less commonly focal patchy enhancement. 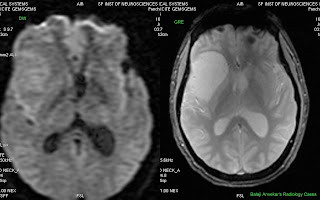 Peripheral enhancement suggest GBM. AA has histologic and imaging characteristics along spectrum between low grade astrocytoma and GBM. Gross features are an infiltrating mass with poorly delineated margins, often expands invaded structures. 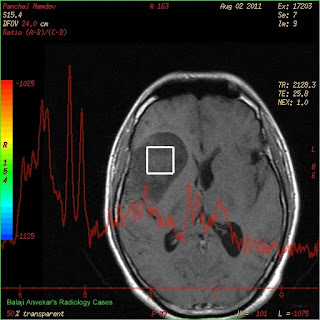 May appear discrete but tumor always infiltrates adjacent brain. 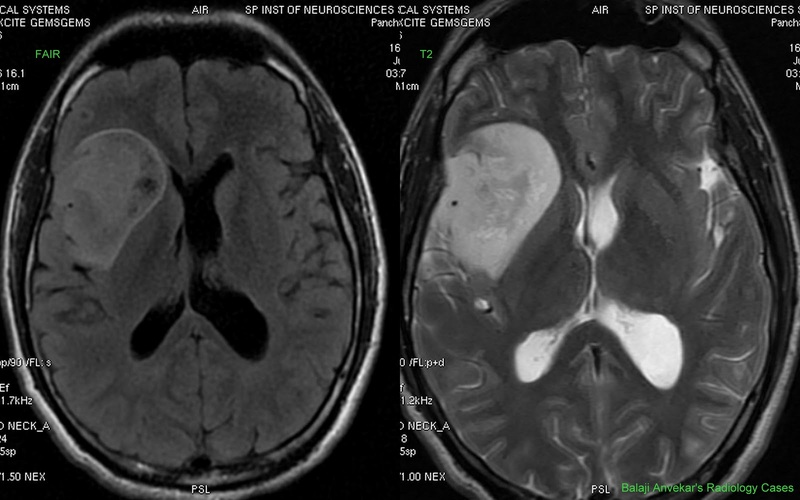 Focal or diffuse white matter mass. Characterized by areas of necrosis and hemorrhages, enhancing rim. Often wedge-shaped, involves GM & WM, area of involvement corresponds to vascular territory. Restricted diffusion if acute/subacute stage of infarction. Gyriform enhancement in sub acute ischemia. 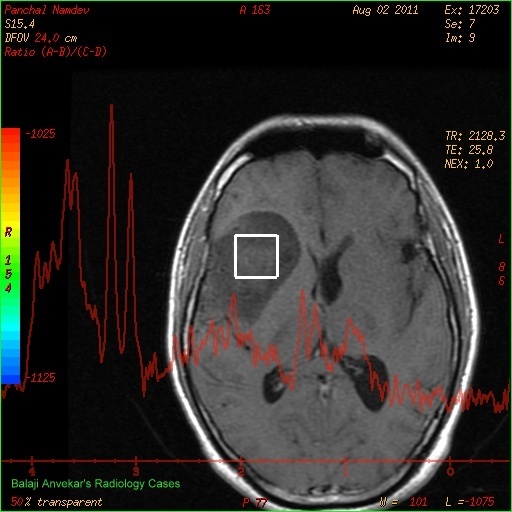 A focal cortical mass with variable enhancement. Signs and symptoms varies with location. Seizures, focal neurologic deficit common. May have headache, drowsiness, vomiting. Resection and radiation therapy, +/- chemotherapy. Reference: Anne G Osborn, Diagnostic imaging I-6.